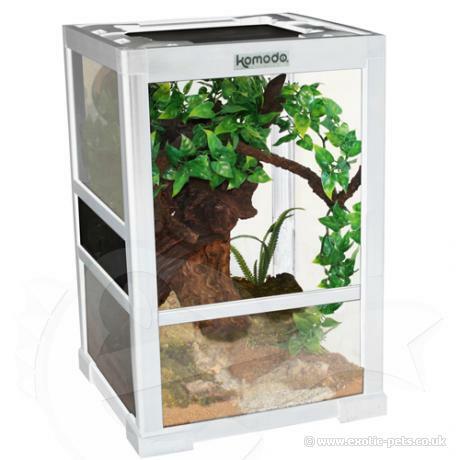 Komodo Easy Assemble Terrariums combine a functional design with a visually attractive enclosure for a variety of herptiles. Conveniently supplied in flat pack form and easy to assemble. The White Gloss Easy Assemble Terrarium adds a contemporary element to an already highly functional design. The gloss finish will add a stylish feature to any reptile habitat, and maintains the high quality features of our standard terrariums. Conveniently supplied in flat pack form and easy to assemble, this terrarium provides excellent ventilation due to the large vent on the side and the complete mesh lid. Also available in an alternative stylish black design.